Great for College Final Exams, Miss You, and Birthday Gifts while away. Also a great Business Appreciation Gift. Perfect variety pack of Snack Food and Treats. Your taste buds will never get bored again. Each is an Individually wrapped snack. Perfect Care Package for College Students Gifts, Birthday Ideas - Send to Say Thank You, Congratulations, I Miss You, Thinking of You. Great Family Gift Box. Boxes will be consistent, you will get what you see and read. 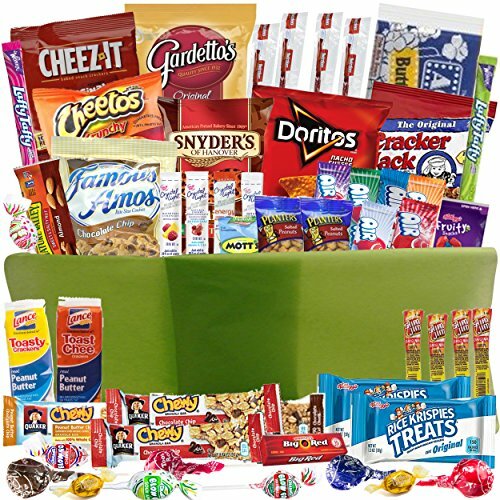 Includes a 6 quart Re-usable Snack Bin carefully packed full of the most loved snacks on the market. Each bin will be shrink wrapped for safe travels. Bin measures 14" x 9" x 5". Makes a quick, easy and convenient snack bucket essentials for road trips, movie watching, truck driver gifts or game night. Save time and money by not having to stop at convenience stores along the way. One Click shopping. Snack bin filled with great school lunch box snack food ideas. Buy now for the guys and girls in your life. Choose gift at checkout to include a personal message. If you have any questions about this product by Catered Cravings, contact us by completing and submitting the form below. If you are looking for a specif part number, please include it with your message. Wing Ditties Breaded Chicken Wingette, 12 Pound -- 1 each.